This site is an independent and authoritative source of information about all things Karakalpak, from the origins and history of the Karakalpak people to their present day lifestyle. 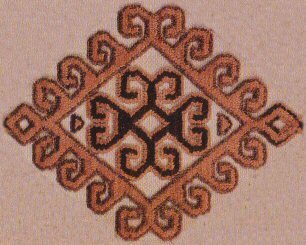 It contains important sections on the traditional material culture of the Karakalpaks, such as costume and yurts. 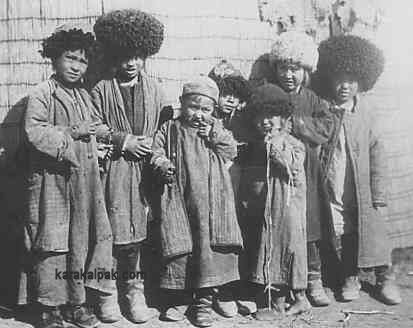 Young Karakalpaks in the 1920s. Image courtesy of the Regional Studies Museum, No'kis. The Karakalpaks are an ethnically diverse Turkic-speaking people who mainly inhabit the isolated delta region of the lower Amu Darya, situated to the south of the Aral Sea. Their exact numbers are unknown but are probably close to 600,000. Their homeland is the Autonomous Republic of Karakalpakstan, formed by the Soviets in 1925. Despite its Autonomous Republic status, Karakalpakstan is effectively little more than just another province within the independent Republic of Uzbekistan, albeit the largest province, accounting for over one third of Uzbekistan's land area. However, most of Karakalpakstan is occupied by barren and inhospitable desert. In the Soviet era its main use was for the production of cotton and the provision of isolated and secret testing sites for chemical and biological weapons. During the past decade or so, sizeable oil and natural gas reserves have been identified under the Ustyurt plateau and the bed of the Aral Sea. The Karakalpaks make up less than a third of the inhabitants of Karakalpakstan, and live alongside large populations of Khivan Uzbeks in the south and Qazaqs in the north, plus some Yomut Turkmen along the western border. The Karakalpaks are one of the poorest ethnic groups within Uzbekistan and they suffer from high unemployment, generally poor living conditions and bad health. In recent decades they have had to contend with the full effects of the desiccation of the Aral Sea and the lower Amu Darya. The desertification of the northern delta has led to an evacuation of its rural population and the growth of the southern urban towns, especially the capital city of No'kis. In the past, Karakalpak life revolved around cattle-breeding, fishing and irrigated agriculture, the main crops being wheat, sorghum, millet, alfalfa, vegetables and fruit. Rushes were extensively harvested for fodder and bedding. Unlike their Qazaq and Turkmen neighbours, the Karakalpaks were not nomadic although they did migrate seasonally with their cattle from their wintering quarters to their summer grazing grounds in the nearby marshes. Under the Soviets an increasing amount of the delta was drained and irrigated for the intensive culture of cotton and rice, as was much of the rest of Uzbekistan and neighbouring Turkmenistan. Indeed it was the development of cotton monoculture coupled with the construction of the Qara Qum Canal that ultimately led to the present Aral Sea environmental disaster. Like many ethnic peoples who lived in monotonous or barren desert environments, the Karakalpaks developed a colourful and vibrant culture, which is clearly Turkic yet remains uniquely Karakalpak. The Karakalpaks overcame their poverty by utilizing all of the natural and agricultural materials available to them. Unlike the nomadic Turkmen they had limited access to sheep’s wool, so instead they used goat hair, cotton, rushes and reeds, fur pelts and calf skin. Although dyes and imported textiles were available from local bazaars they were expensive, so Karakalpak women used every scrap of thread and textile available to them, creating works of art from virtually nothing. The most distinct features of Karakalpak material culture are expressed in women’s costume, especially women’s bridal wear, and in the decoration of the Karakalpak yurt. Although Islam was suppressed by the Soviet authorities, most Karakalpaks have maintained a semblance of their faith, although mosques are few and far between. However many of their customs and traditions may well have more ancient origins, predating the conversion of the Turkic tribes to Islam under the Golden Horde. We would like to acknowledge the help of webdesigner Tim Randall at http://www.northern-images.co.uk in the construction of this website. We could not have undertaken this project without the valuable assistance of many people throughout Karakalpakstan, as well as in Uzbekistan, Russia, the United Kingdom and elsewhere. We thank them all for their time and patience in answering our multitude of questions. The karakalpak.com website was launched in 2005. This page was last updated on 1 February 2012.